For the character Woland in Bulgakov's novel, see Woland. "Weyland Smith" redirects here. For the Vertigo comics character, see List of Fables characters. In Germanic mythology, Wayland the Smith (Old English: Wēland; Old Norse: Völundr, Velentr; German: Wieland der Schmied; Old High German: Wiolant; Galans (Galant) in Old French; Proto-Germanic: *Wēlandaz from *Wēla-nandaz, lit. "battle-brave") is a legendary master blacksmith, described by Jessie Weston as "the weird and malicious craftsman, Weyland". In Old Norse sources, Völundr appears in Völundarkviða, a poem in the Poetic Edda, and in Þiðreks saga, and his legend is also depicted on Ardre image stone VIII. In Old English sources, he appears in Deor, Waldere and in Beowulf and the legend is depicted on the Franks Casket. He is mentioned in the German poems about Theoderic the Great as the Father of Witige. Völund's smithy in the centre, Niðhad's daughter to the left, and Niðhad's dead sons hidden to the right of the smithy. Between the girl and the smithy, Völund can be seen in an eagle fetch flying away. From the Ardre image stone VIII. According to Völundarkviða, the king of the Finns had three sons: Völundr (Wayland) and his two brothers Egil and Slagfiðr. In one version of the myth, the three brothers lived with three Valkyries: Ölrún, Hervör alvitr and Hlaðguðr svanhvít. After nine years, the Valkyries left their lovers. Egil and Slagfiðr followed, never to return. In another version, Völundr married the swan maiden Hervör, and they had a son, Heime, but Hervör later left Völundr. In both versions, his love left him with a ring. In the former myth, he forged seven hundred duplicates of this ring. Later, King Niðhad captured Völundr in his sleep in Nerike and ordered him hamstrung and imprisoned on the island of Sævarstöð. There Völundr was forced to forge items for the king. Völundr's wife's ring was given to the king's daughter, Böðvildr. Niðhad wore Völundr's sword. In revenge, Völundr killed the king's sons when they visited him in secret, and fashioned goblets from their skulls, jewels from their eyes, and a brooch from their teeth. He sent the goblets to the king, the jewels to the queen and the brooch to the king's daughter. When Böðvild takes her ring to Völundr for mending, he tricks her into drinking beer and she passes out. While Böðvild lies unconscious Völundr rapes her. As she wakes up a laughing Völundr flies to Niðhad's hall where he explains how he has murdered the king's sons, fashioned jewelry from their bodies and fathered a child with Böðvild. The crying king laments that his archers and horsemen can't reach Völundr, as the smith flies away never to be seen again. Niðhad summons his daughter, asking her if Völundr's story was true. The poem ends with Böðvild stating that she was unable to protect herself from Völundr as he was too strong for her. Völundr made the magic sword Gram (also named Balmung and Nothung) and the magic ring that Thorsten retrieved. The Scandinavian Thidrekssaga/Didrikssaga also includes a version of Wayland's story. This part of the saga is sometimes called Velents þáttr smiðs. The events described at King Niðung's (Nidhad's) court broadly follow the version in the Poetic Edda (though in the saga his brother, Egil the archer, is present to help him to make his wings and to help him escape). However, the rest of the story is different. It tells of how Wayland was the son of a giant named Wade, and how he was taught to smith by two dwarfs. It also tells of how he came to be with King Nidung, crossing the sea in a hollow log, and how he forged the sword Mimung as part of a bet with the king's smith. And it also tells about the argument that led to Nidung's hamstringing of Wayland, and ultimately to Wayland's revenge: Nidung had promised to give Wayland his daughter in marriage and also half his kingdom, and then went back on this promise. The saga also tells of the birth of a son, Wideke/Viðga, to Wayland and Nidung's daughter. This son goes on to become one of Thidrek/Didrik's warriors. The hamstrung smith Weyland from the front of the eighth-century Northumbrian Franks Casket (see text). Panel Civ (south face, lowest panel) of the c. tenth-century Leeds Cross, depicting Wayland (below) holding Beaduhild/Bǫðvildr above his head, at a right angle. Wayland's head has been lost, but his wings are visible to the left and right, and his tools at the bottom of the panel. Fate goes ever as fate must. The Franks Casket is one of a number of other Old English references to Wayland, whose story was evidently well known and popular, although no extended version in Old English has survived. The reference in Waldere is similar to that in Beowulf – the hero's sword was made by Weland – while Alfred the Great in his translation of Boethius asks plaintively: "What now are the bones of Wayland, the goldsmith preeminently wise?":p. 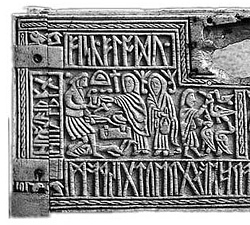 29 In the front panel of the Franks Casket, incongruously paired with an Adoration of the Magi, Wayland stands at the extreme left in the forge where he is held as a slave by King Niðhad, who has had his hamstrings cut to hobble him. Below the forge is the headless body of Niðhad's son, whom Wayland has killed, making a goblet from his skull; his head is probably the object held in the tongs in Wayland's hand. With his other hand Wayland offers the goblet, containing drugged beer, to Böðvildr, Niðhad's daughter, whom he then rapes when she is unconscious. Another female figure is shown in the centre; perhaps Wayland's helper, or Böðvildr again. To the right of the scene Wayland (or his brother) catches birds; he then makes wings from their feathers, with which he is able to escape. During the Viking Age in northern England, Wayland is depicted in his smithy, surrounded by his tools, at Halton, Lancashire, and fleeing from his royal captor by clinging to a flying bird, on crosses at Leeds, West Yorkshire, and at Sherburn-in-Elmet and Bedale, both in North Yorkshire. English literature was also aware of his giant father Wade. Both the Austrian composer Siegmund von Hausegger (1904) and the Russian composer Leopold van der Pals (1913) used the Wayland saga as inspiration for symphonic poems. ^ Gillespie 1973, pp. 142–143. ^ a b c Weston, J. (1929). 'Legendary Cycles of the Middle Age', in Tanner, J.R. (ed. ), The Cambridge Medieval History Vol. VI, Cambridge, UK: Cambridge University Press, p. 841f. ^ Pollington, Steve (Transl.) (1997). "deor". Wiðowinde. 100: 64. Archived from the original on 10 April 1997. Retrieved 18 March 2017. (Subscription required (help)). Cite uses deprecated parameter |subscription= (help) The home page for this print journal can he found here. ^ Gordon, R. K. (1954). Anglo-Saxon Poetry, London: Dent, p. 65. This is a partial text of the Walder fragments in modern English. See the start of fragment A for Wayland. ^ a b c Shippey, Tom (2014). The Road to Middle-earth: Revised and Expanded Edition. Houghton Mifflin Harcourt. ISBN 9780547524412. Wikisource has the text of the 1911 Encyclopædia Britannica article Wayland the Smith. Wikimedia Commons has media related to Wieland.